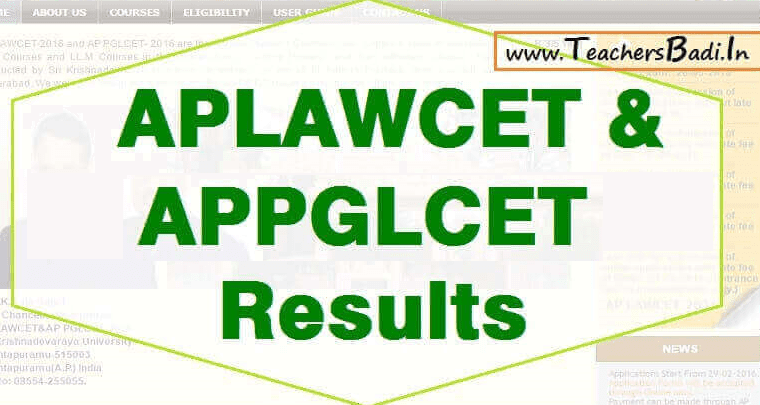 #AP Lawcet 2019 Results/ #APLAWCET 2019 and #AP PG LAWCET 2019 Results: APLAWCET-2019 and APPGLCET- 2019 are the Andhra Pradesh Common Law Entrance Tests for admission into LL.B 3/5 Year Law Courses and LL.M Courses in the Universities in Andhra Pradesh and their affiliated colleges. These tests are being conducted by Sri Krishnadevaraya University, Anantapur on behalf of Andhra Pradesh State Council of Higher Education, Hyderabad. Sri Krishnadevaraya University, Anantapur issued the AP Law Common Entrance Test (APLAWCET) 2019 and AP PG Law Common Entrance Test(APPGLCET) 2019 notification in February, 2019. The University invited the applications from the eligible students through online mode for admission into 3 or 5 years law courses(LLB) through APLAWCET and admission into LLM courses through APPGLCET offered by state universities in AP State including their affiliated colleges for the academic year 2019-2020 from ..-03-2019 to ..-04-2019 as per its schedule. The candidates, who were applied for this entrance tests, they were attended the law entrance exam ...-04-2019 by 2-30 pm to 4-00 pm and they are waiting for their results for join into law courses.. The results 2019 of PGLCET and LAWCET will be uploaded at web portal by the Department of Law, SKU. AP LAWCET & AP PGLCET 2019 Results will be released after 30th April 2019. AP LAWCET, PGLCET exams 2019 Results to be declared soon at sche.ap.gov.in/ AP LAWCET, PGLCET exams 2019 Results: The Andhra Pradesh State Council of Higher Education (APSCHE) is likely to declare the results for the state LAWCET and PGLCET examinations today. Candidates who have appeared for the paper on April ..., 2019 can check the same from the official website. The LAWCET and PGLCET exams were conducted to selects students for admission in 3 and 5 year LLB courses and postgraduate LLM law courses in various recognised institutions in the state. Sri Krishnadevaraya University, Ananthapuramu, Andhra Pradesh conducted the paper on behalf of the APSCHE. According to the APSCHE, the test is “designed to evaluate the candidate’s General Knowledge, Mental ability, Current Affairs and aptitude to pursue the study of Law”. Candidates had to answer 120 questions in 90 minutes. The LAWCET paper was divided in three parts. Part 1 was for General Knowledge and Mental Ability, part 2 for Current Affairs and part 3 for Aptitude for the Study of Law. Parts 1 and 2 had a weightage of 30 marks while part 3 had a weightage of 60 marks. The PGLCET paper followed a similar pattern and both papers contained multiple choice questions. The qualifying marks for LAWCET is 35 per cent (40 out of 120 marks) and the minimum marks required to clear PGLCET is 25 per cent (30 out of 120 marks). Releasing LAWCET results, the HRD minister said 5,826 candidates appeared for 3-year LLB course and 4,788 qualified thus recording a pass percentage of 82. Sri Krishnadevaraya University conducted the LawCET at 35 centres in the state on April 19.He informed that 1,265 candidates appeared for 5 years LLB and 1087 candidates have qualified recording a pass percentage of 85. He said that 333 candidates appeared for 2- year PG LLM course and 320 candidates qualified thus registering a pass percentage of 96. AP LAWCET result 2019: The results of the Andhra Pradesh Common Law Entrance Test (AP LAWCET) will be announced after April 30 on sche.ap.gov.in. The result was expected on Wednesday, but the exam conducting body Sri Krishnadevaraya University, Anantapur has issued a notification saying that the results will be published after April 30. The exam was held on April 19. 1. Log on to the official website. 2. Click on the link which shall be given on the homepage. 3. Key in the required information. 4. After doing all this, your AP LAWCET Result 2019 shall come up on the screen. 5. Make sure you download it and get a printout for future purposes. The AP LAWCET took place on April 19 for admission to the first year of 5-year LLB /3-year LLB. The exam was held by Sri Krishnadevaraya University, Ananthapuramu, Andhra Pradesh across 16 different centres in Andhra Pradesh. About SKU: Sri Krishnadevaraya University, Ananthapuramu, began as a Postgraduate Centre of Sri Venkateswara University in 1967-68. It got autonomy in 1976. To get further details regarding the result, candidates can log on to the official website. Step 1: Go to the official website for APSCHE (sche.ap.gov.in). Step 2: Click on the link for AP LAWCET 2019. Step 3: Follow the notification for the exam results. Step 5: Download your results and take a print out for further reference.